A friend of ours reserved 6 Cronuts online and we could luckily try April's flavor "Burnt Vanilla Smoked Caramel." 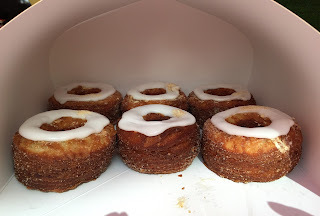 They put all the 6 Cronuts into one box and both the box and the bag were HUGE. Compared with a Diet Coke can (12 oz.). 6 Cronuts all together had a tremendous impact, in a way. We had the still-hard-to-get Cronuts in the mini garden which is at the back of the bakery, and there's a blooming Sakura tree. The outside was crispy as it's a fried pie sheet and it's also crunchy because of the sugar on the entire surface. The filling was fluffy, light, and sweet caramel. I somehow tasted some nutty flavor but others said they didn't taste it, so it might have been only my imagination. As for Burnt Vanilla, the Smoked Caramel flavor was quite strong and I didn't really notice it. How hard is it to get Cronuts there? I also saw that in Japan, they have matcha drink with Sakura shaped marshmallow. It's not that hard compared to when it just opened. I've seen the marshmallow too! Works like magic! Here, they're still hard to get and I and our friend booked Cronuts on line. In Tokyo, do they have reservation system or as long as you go there first thing in the morning, you can get it? I've never heard of the reservation system here. I've been there twice on Sunday afternoon and I can get both the cronut and DKA easily. I even managed to get a seat! Just a 5-min queue at the cashier! I definitely have to make a trip when I'm back in Japan again.